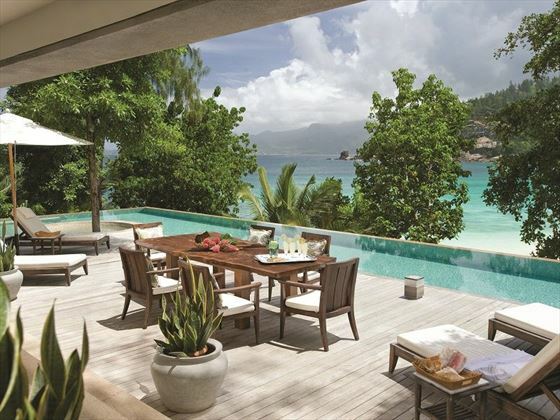 The luxurious island lifestyle awaits at the beautiful Four Seasons Resort Seychelles. 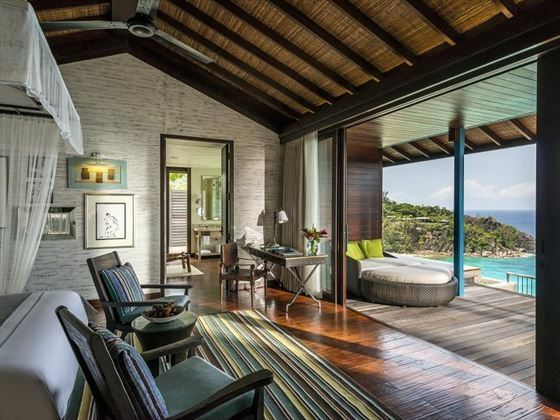 Nestled on a luscious hillside along the secluded beach of Petite Anse in Mahe, each lavish villa and suite is isolated and hidden in the jungle, offering a perfect, private holiday. 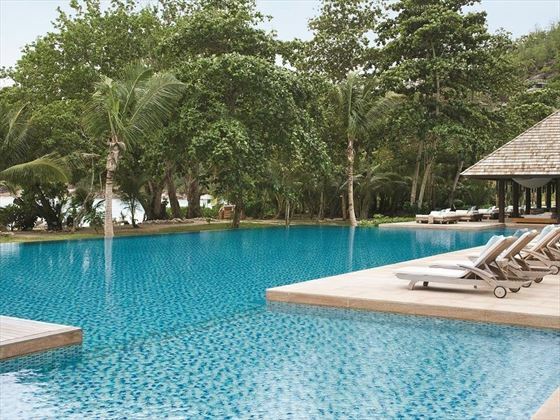 The lush hillside leads down to a pristine white sand beach, host to a myriad of fun water sports, or you could simply dip your toes in your private infinity pool. 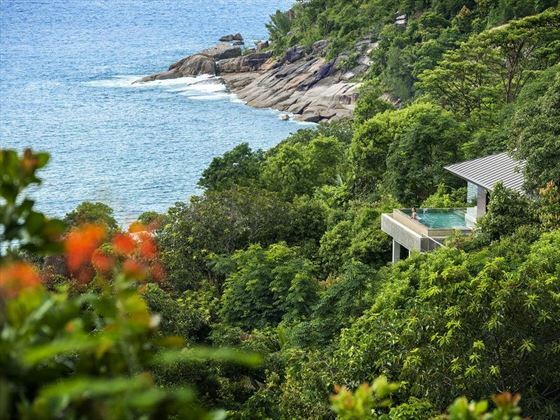 Each exclusive treehouse villa offers panoramic views of ocean, beach and forest, as well as sophisticated décor and complete privacy – you’ll be sure to feel like royalty here. 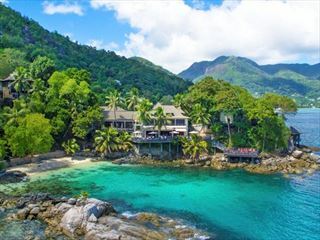 The resort’s local creole style can be found in both the décor and the cuisine, offering two sumptuous restaurants, and two cool and casual bars. There’s plenty for kids here too, including fun kid’s and teen clubs, and plenty of thrilling activities. Fancy truly relaxing? The resort’s spa is located near the top of the hill, offering incredible views as you enjoy rejuvenating treatments. 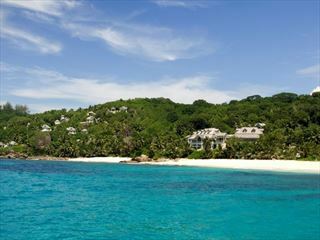 This fabulous resort is nestled on the secluded bay of Petite Anse, sitting along the southwest coast of Mahe. Hidden within a jungle-clad hill, the resort feels intimate and secluded, offering you the ideal island lifestyle experience. 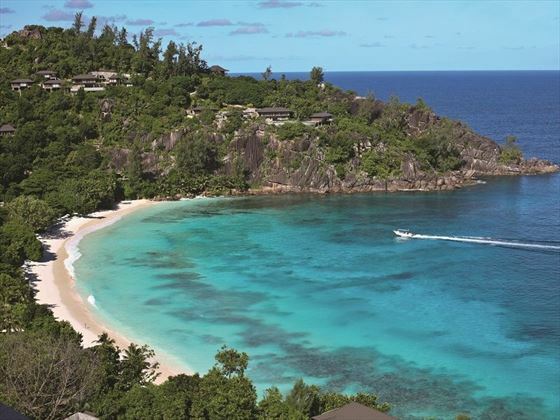 The resort is a 35 minute drive to Seychelles International Airport. Garden View Villa – The most suitable choice for small children as they’re located near the bottom of the hill and just steps from the beach. Offering 186sqm of comfort and style close by to the restaurants. Sleeps a maximum of three adults in a king-bedded room, or two adults and one child in a queen-bedded room. 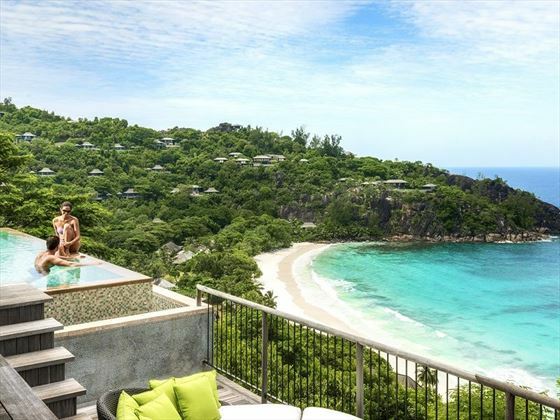 Ocean View Villa – Nestled above the island’s granite terrain, these charming 186sqm villas offer fantastic views of the ocean. Sleeps a maximum of three adults or two adults and one child in a king-bedded villa, or two adults and two children in a queen bedded villa. 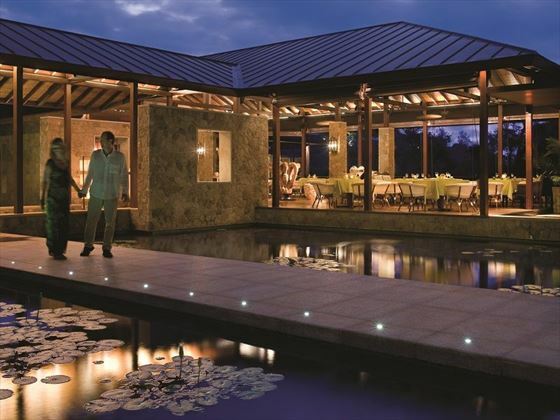 Hilltop Ocean View Villa – Beautiful 186sqm villas with scenic views of the ocean from the wraparound deck. Sleeps a maximum of three adults or two adults and one child in a king-bedded villa, or two adults and two children in a queen bedded villa. 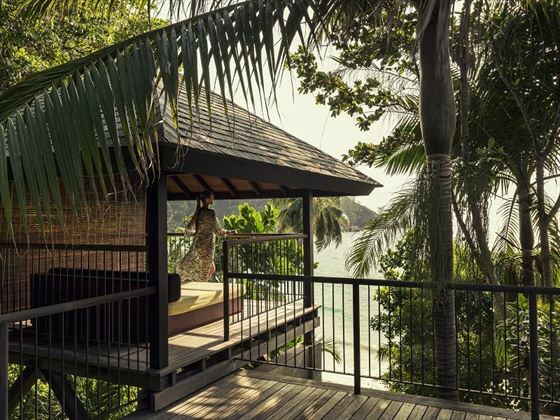 Serenity Villa – The luxury, secluded 186sqm treehouse is perfect for couples, offering the most beautiful view in the resort, with views of the ocean and surrounding forests. Sleeps a maximum of two adults and one child. Two Bedroom Ocean View Suite – Luxurious 524sqm suites, offering a separate living area overlooking the private furnished pool deck, a dining area seating up to six guests, and beautiful views. Sleeps a maximum of four adults and two children. 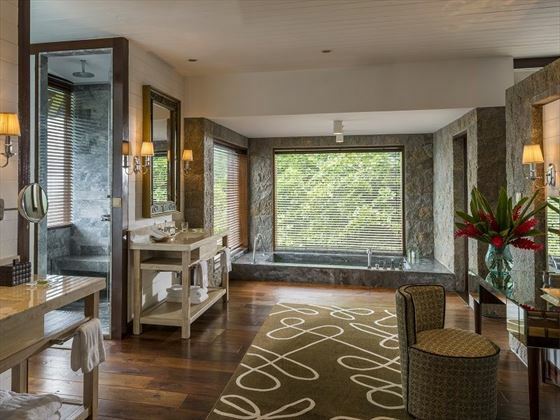 Two Bedroom Hilltop Ocean View Suite – Sophisticated 542sqm suites surrounded by lush jungle, offering the same amenities as before, plus butler service available on request. Sleeps a maximum of four adults and two children. 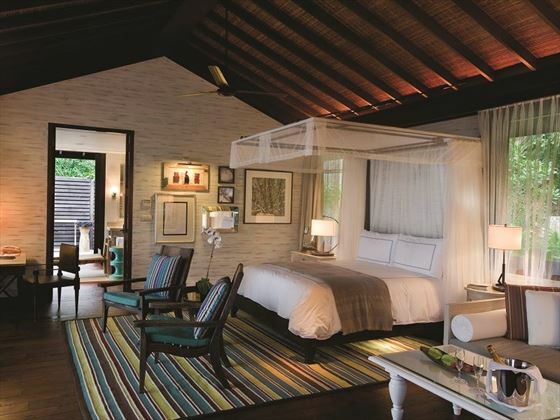 Two Bedroom Presidential Suite – Only steps away from the beach, with gorgeous views of the ocean. These 734sqm suites have three pavilions, plus a separate living room overlooking the pool deck. Sleeps a maximum of four adults and two children. 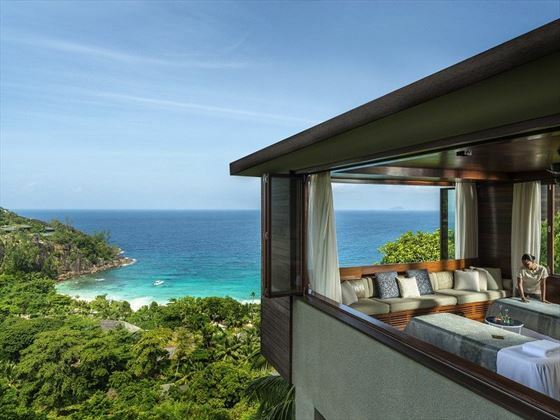 Three Bedroom Royal Suite – With amazing views of the ocean, beach and jungle, this 859sqm suite has four pavilions, three of which have secluded bedrooms, whilst the fourth holds a two storey space with indoor entertainment area. Also features a living area, dining area, study, den, and expansive wooden deck with pool and whirlpool. Sleeps a maximum of six adults and four children. Three Bedroom Residence Villa – Fabulous private 971sqm villas with three outdoor decks, three bathrooms, a dining room for 10 guests, and a gourmet kitchen with butler’s quarters. Sleeps a maximum of six adults and one child, or four adults and three children. Four Bedroom Residence Villa – Lavish 1,387sqm villas offering four bedrooms and bathrooms, two furnished decks, and a balcony for every bedroom with gorgeous views. Sleeps a maximum of eight adults, or four adults and four children. Five Bedroom Residence Villa – Incredible 1,400sqm villas offering five luxurious bedrooms, each with their own balcony, two decks, two private pools, and a full equipped home entertainment system. Sleeps a maximum of 10 adults, or six adults and four children. Six Bedroom Residence Villa – Spectacular 1,586sqm two storey villas nestled on the hillside, with an expansive wooden deck area, uninterrupted ocean views, two living areas, a large sundeck, manicured gardens, and a dining room for 12 people. Sleeps a maximum of 12 adults, or eight adults and four children. ZEZ – Offering modern European cuisine and contemporary interpretations of classics with spectacular sunset views. The signature dish is tuna tartar and mahi mahi with lentil salad and red wine tomato dressing. Open 7am-10.30am and 7pm-11pm, with a children’s menu available. Dress code: smart casual. 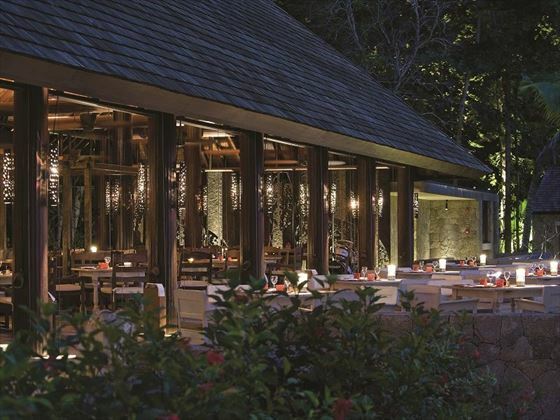 Kannel – A stylish yet informal restaurant next to the main pool, serving international cuisine at lunch, and Creole and Asian fare at dinner. Open 12pm-3.30pm and 7pm-11pm, with a children’s menu available. Dress code: smart casual. Zez Lounge – A sophisticated lounge, offering great homemade sushi and sashimi, as well as the perfect setting for pre-dinner or after-dinner drinks. Open 6pm-11pm. Kannel Bar – Sitting next to the pool and close to the beach, this casual bar offers a great place to relax with a light snack or fruity cocktail. Open 10am-11pm. Fitness centre overlooking the Indian Ocean – free gym wear available, with weight training, studio classes, and certified trainers. Open 24/7. 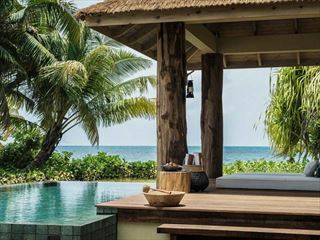 The resort’s spa is nestled amidst luscious gardens at the highest point of the hill, offering sweeping Indian Ocean views from the eight treatment rooms. Treatments include massages, body treatments, facials, and yoga classes. *Min. of 5 nights stay required.